A few weeks ago you caught a glimpse of our redone basement. We put it back together after our waterproofing contractors finished their work. Fortunately, the carpet and underpad were not damaged by the leaks, so we were able to reuse them. (Although they could use a good cleaning). Our contractors had folded the carpet back out of the way while they were doing their work. 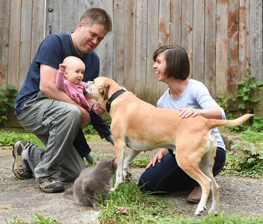 After giving everything–the carpet, the underpad, the concrete–a really good vacuum we were able to unfold the underpad and lay it back down over the concrete. The vacuum is critical. 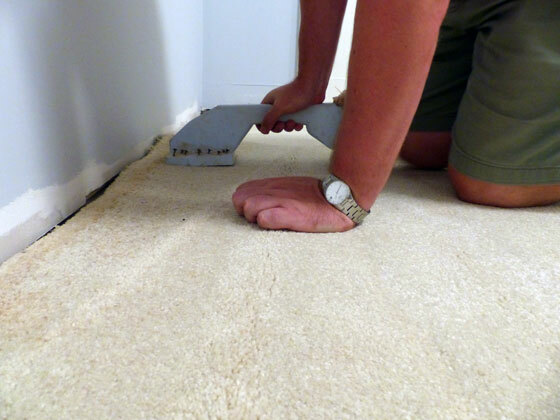 You don’t want to discover any bumps under your carpet once you’re finished installing it, so make sure everything is really clean and smooth. The next step was to install new tackstrips, also known as smoothedge. 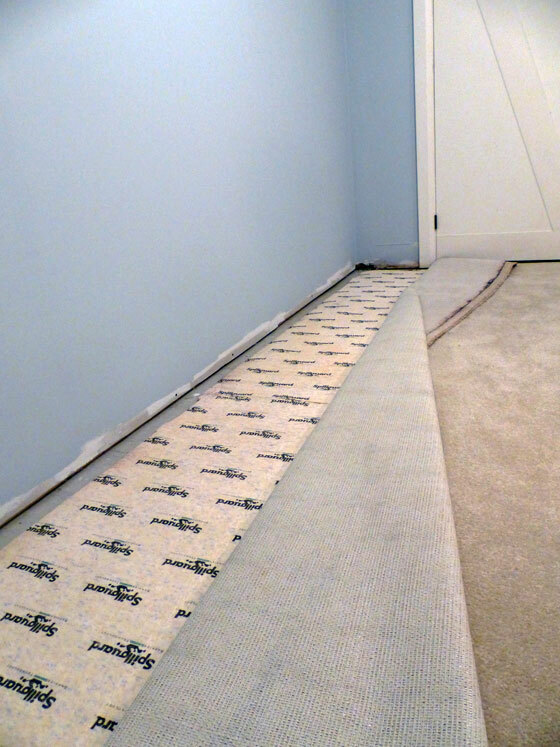 The tackstrips are what hold the carpet in place. The underpad provides the guide of where to install the strip. 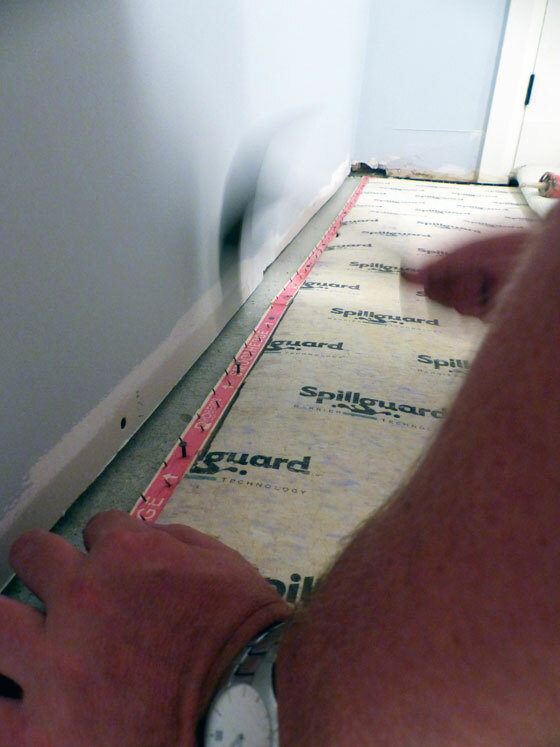 Tackstrips come in two different versions–one for wood subfloor and one for concrete. Make sure you buy the right type for your floor. Line the tackstrip up with the edge of the underpad with the little spikes pointing in towards the wall. Hammer the small nails in the tack strip into your floor. With our new concrete from the waterproofing, we found the nails did not want to go in. We ended up gluing the tackstrips to the concrete with construction adhesive. 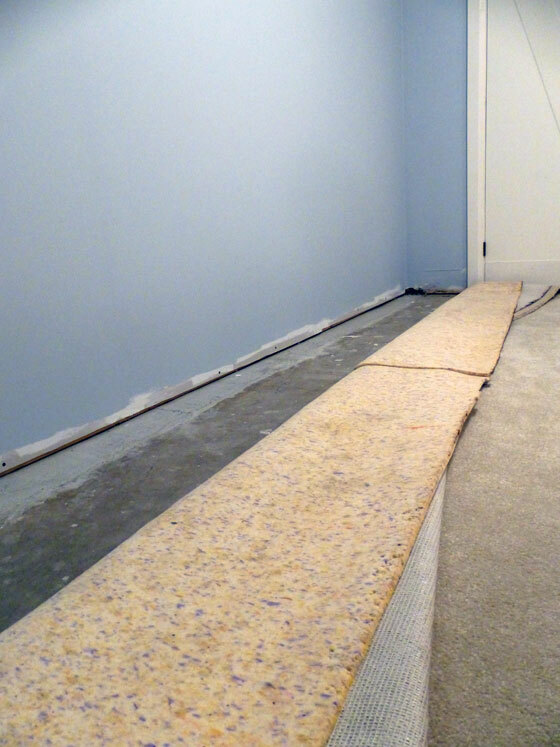 Once the glue was set, we unfolded the carpet and laid it over the tack strips. It’s important to stretch your carpet tightly. For this, you need a carpet kicker. I’ll share how you can make your own kicker in an upcoming post. 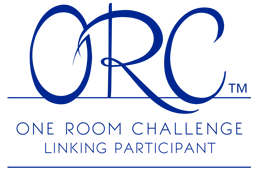 The idea is you lay your kicker on the carpet and using your knee you kick the carpet towards the wall. 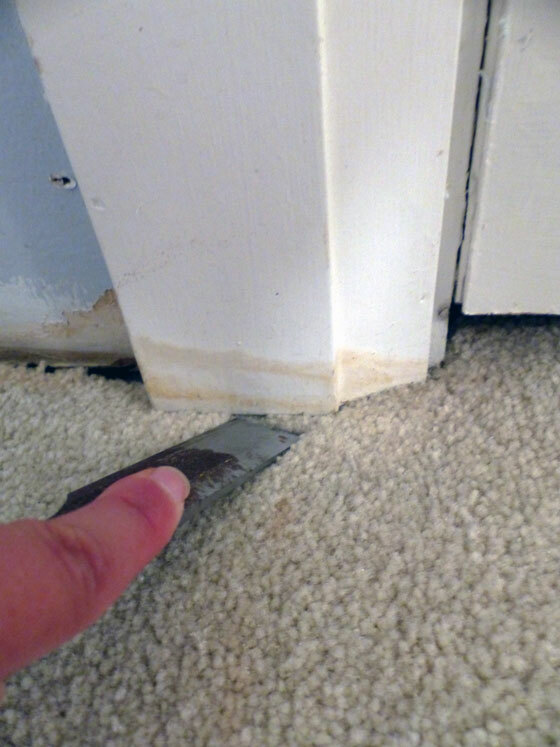 While the carpet is stretched tight, run your hands over the edge to press it onto the tack strip. You should feel the carpet catch on the spikes. As you get towards the corner, kick on a bit of a diagonal to push the carpet towards both walls. And that’s all there is to it. I’m so grateful that we were able to reuse the carpet. 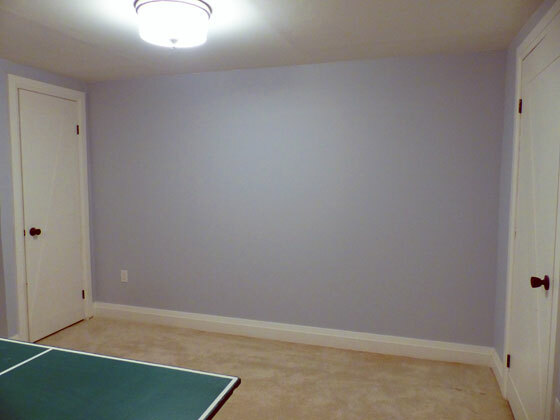 This carpet goes through the whole basement, so redoing this one area would not have been an option. Plus installing it ourselves was a quick and easy DIY. Have you ever installed carpet yourself? Good job getting the carpet back in place! I’ve never been able to reuse carpet after a flood. I have removed carpet and staples from floors however, and it’s very un-fun. Those tack strips are nasty beasts! Did you find the carpet caught on them when you were trying to stretch it towards the wall? That sounds incredibly un-fun. The carpet did catch on the tackstrips, but just in the way we wanted them to. The install went pretty smoothly.